This is another card I had made at Sue's "Card Buffet" last month. It's among my favorites. I LOVE the colors (Rich Razzleberry and Melon Mambo) in this card. The Rich Razzleberry just makes the Melon Mambo just pop, doesn't it? And that white on the left side is the "Bride" specialty paper. I LOVE the layout of this card too. I don't have this set but I can do this layout with other sets I have. 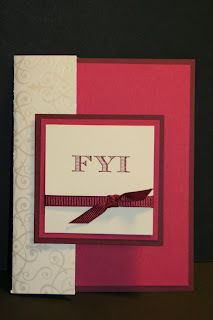 It's a fun and quick card and not to mention pretty too! And it's very versatile too. You can use it for many other occasions. I love that in a card and layout. This week I have some fun projects coming up so be sure to stay tuned! This card is so lovely and elegant!